Decreases the discharge rate of sinus node. Decreases AV nodal conduction: (AV) block. Adenosine is a strong vasodilator, and may result in hypotension, flushing and headache. Strong vasodilation may result in coronary steal effect in patients with coronary artery disease. Ultra-short acting: Half-life is < 10 seconds. Side-effects disappear quickly. When compared to verapamil, adenosine is safer due to its ultra-short half-life (< 10 seconds). 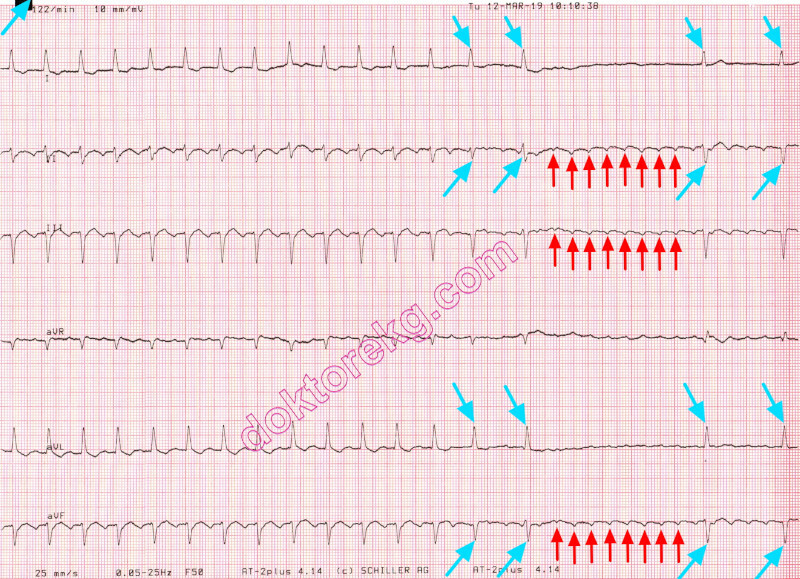 - Adenosine CAN NOT convert atrial flutter or atrial fibrillation to sinus rhythm. - to differentiate Ventricular Tachycardia from wide QRS complex SupraVentricular Tachycardia. 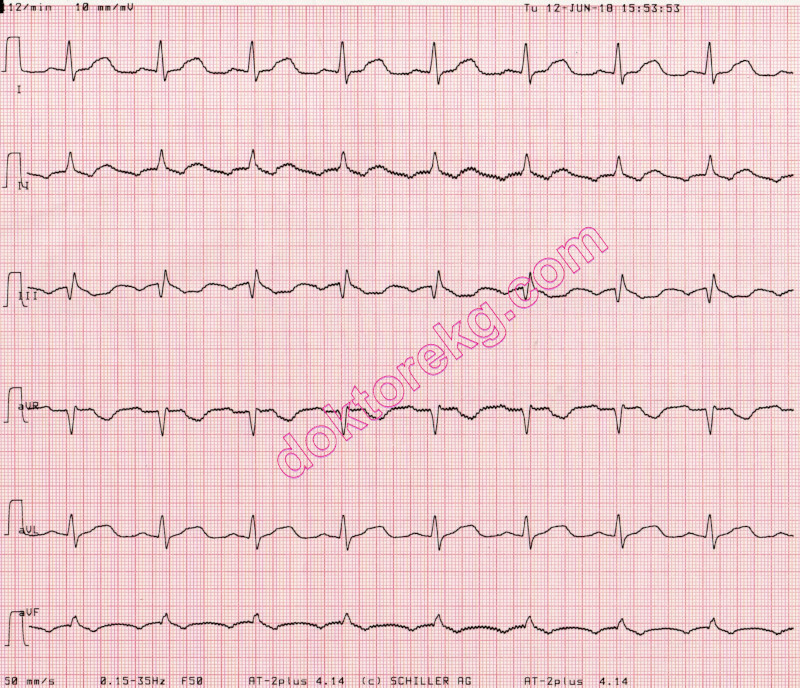 - to diagnose masked atrial flutter. 1:1 AV conduction after a brief period of high grade AV block. 2003 ACC/AHA/ESC Guidelines for the Management of Patients With Supraventricular Arrhythmias. 2013 ESC Clinical Practice Guidelines: Stable Coronary Artery Disease (Management of). ECG 1a. The ECG above belongs to a 14 years-old male complaining of palpitation. Narrow QRS tachycardia with a heart rate of 165/minute is seen. ECG 1b. The ECG above was recorded immediately after i.v. administration of 10 mg Adenosine to the same patient. Sinus rhythm with a heart rate of 82/minute is seen. ECG 2. The ECG above is from a child with narrow QRS tachycardia. It was recorded during Adenosine infusion. Adenosine-induced transient AV block permitted the clear observation of P waves: atrial flutter. Pediatric cardiologist Prof. Dr. Birgul Varan has donated the above ECG to our website. narrow QRS tachycardia. The non-sustained VT attack is followed by several VPCs and a 1.5 second long pause. Sinus rhythm is restored afterwards. ECG 4a. The ECG above belongs to a 60 years-old woman complaining of palpitation. Narrow QRS tachycardia with a heart rate of 182/minute is seen. Dr. Ahmet Uzan has donated the above ECG to our website. ECG 4b. The ECG above was recorded immediately after i.v. administration of 10 mg Adenosine to the same patient. 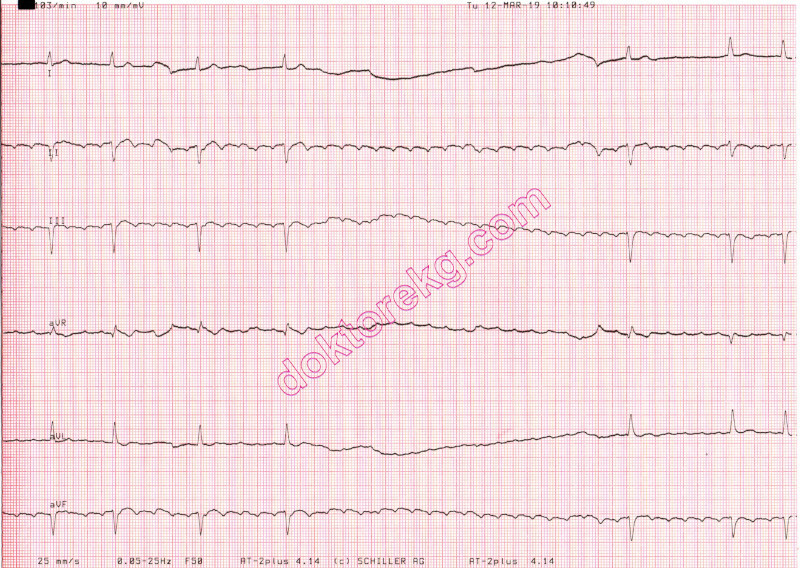 Conversion to sinus rhythm is seen. ECG 5a. 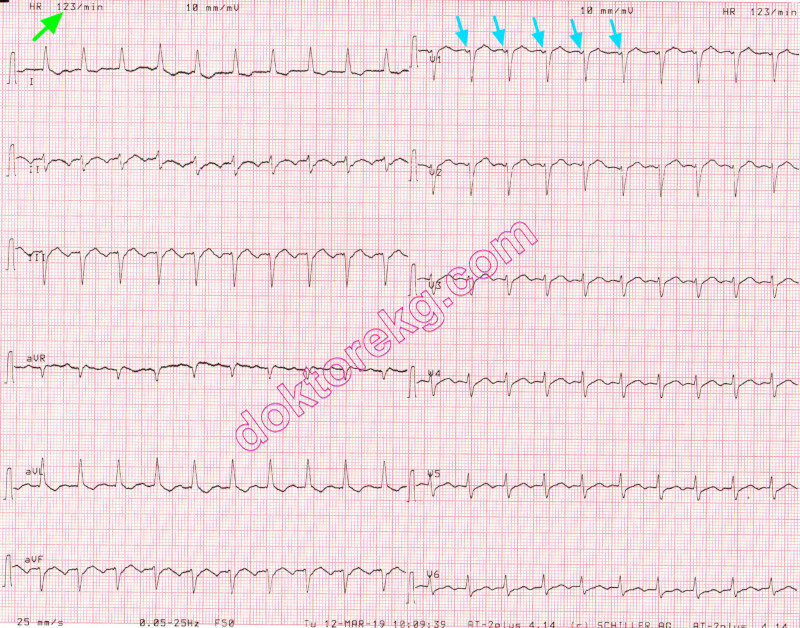 The ECG above is form a 31 years-old man who was admitted to the Emergency Room with the complaint of palpitation. 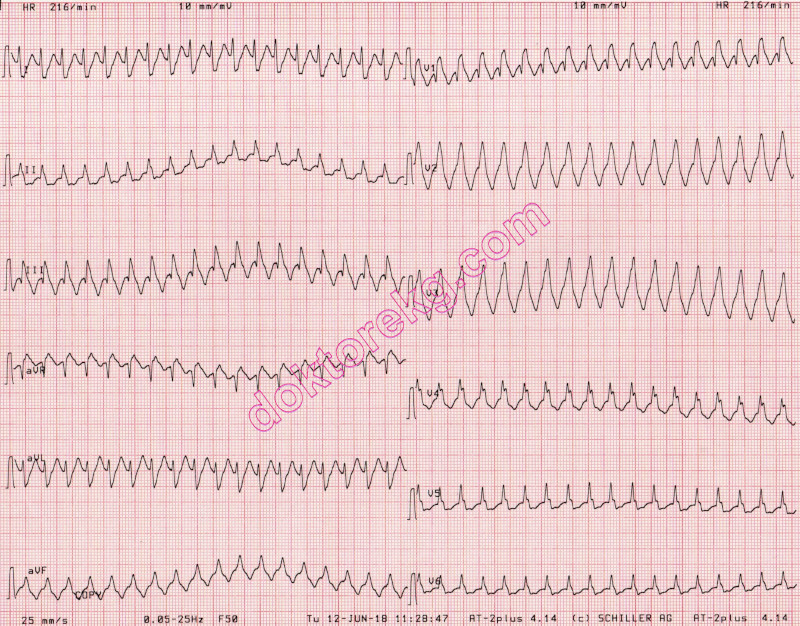 Wide QRS complex tachycardia is seen. The ventricular rate is 216/minute. Is it ventricular tachycardia? ECG 5b. The ECG above belongs to the same patient. It was recorded during intravenous injection of 10 mg Adenosine. Temporary atrioventricular (AV) block during Adenosine injection reveals the underlying rhythm as atrial flutter. The mid part of the ECG shows 4:1 AV block. 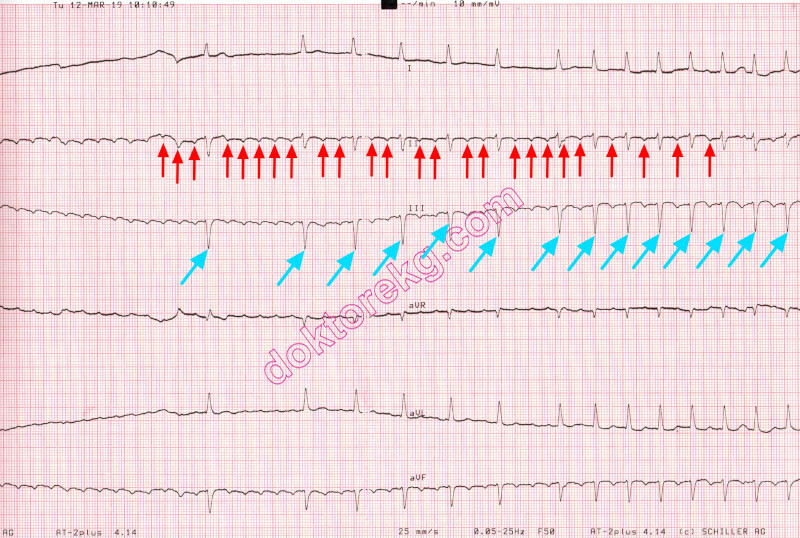 As the effect of Adenosine decreases rapidly, first 3:1 then 2:1 AV block is seen. The right side of the ECG shows atrial flutter with a 1:1 conduction. ECG 5c. The above ECG was recorded immediately after recording the ECG 5b. Since Adenosine half-life is less than 10 seconds, the heart rate becomes 216/minute again. 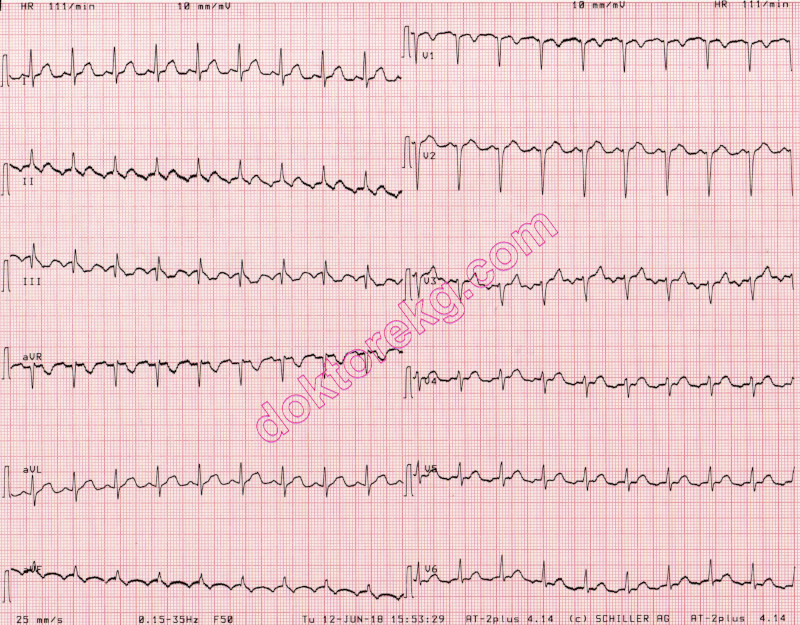 In this case, Adenosine did not convert the arrhythmia but easily showed that the rhythm was atrial flutter. ECG 5d. The ECG above belongs to the same patient. It was recorded after 3 hours of i.v. Amiodarone infusion. The rhythm is atrial flutter with 2:1 AV block. Saw-tooth appearence is clearly seen in leads II and aVF. ECG 5e. The rhythm tracing above belongs to the same patient. It was recorded immediately after the ECG 5d, but at at a paper speed of 50 mm/second. ECG 6a. The ECG above belongs to a 68 years-old man with Chronic Obstructive Pulmonary Disease (COPD). ECG 6b. The above ECG belongs to the same patient and shows the onset of Adenosine effect. It was recorded at 10:10:38 and shows the rhythm one minute after the ECG 6a. This is atrial flutter. The rhythm in ECG 6a was atrial flutter. ECG 6c. The above ECG belongs to the same patient and shows Adenosine effect. 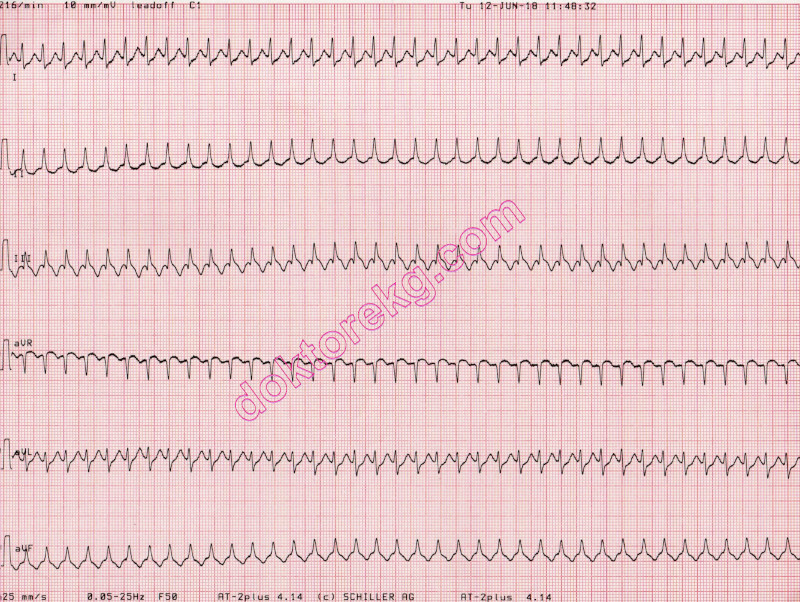 It is the continuation strip of ECG 6b. 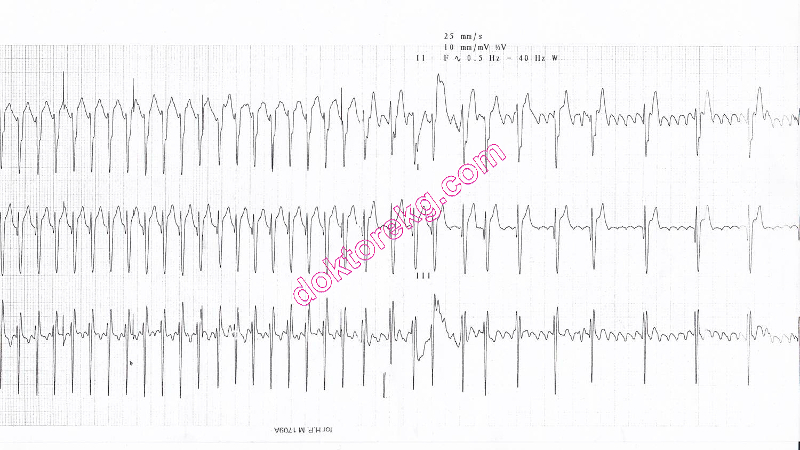 Adenosine injection caused atrioventricular (AV) block and resulted in a pause of 5.4 seconds. 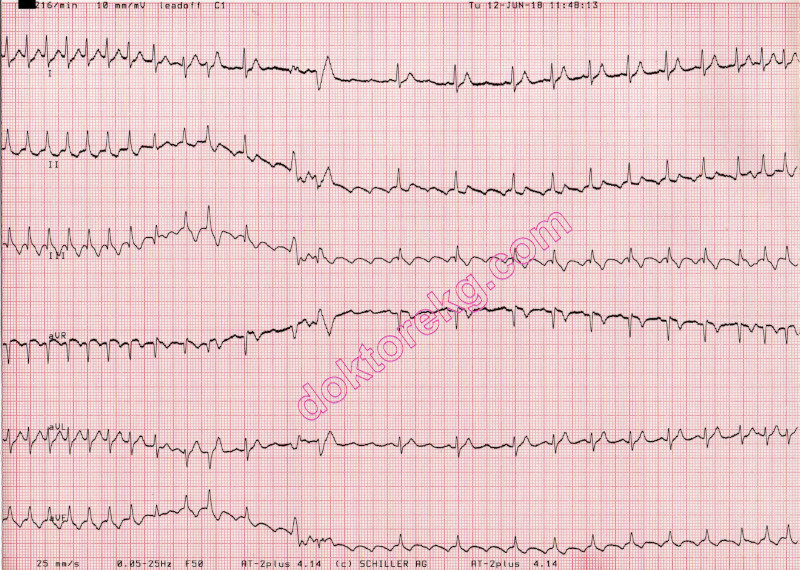 The rhythm is atrial flutter and flutter waves are clearly seen. ECG 6d. 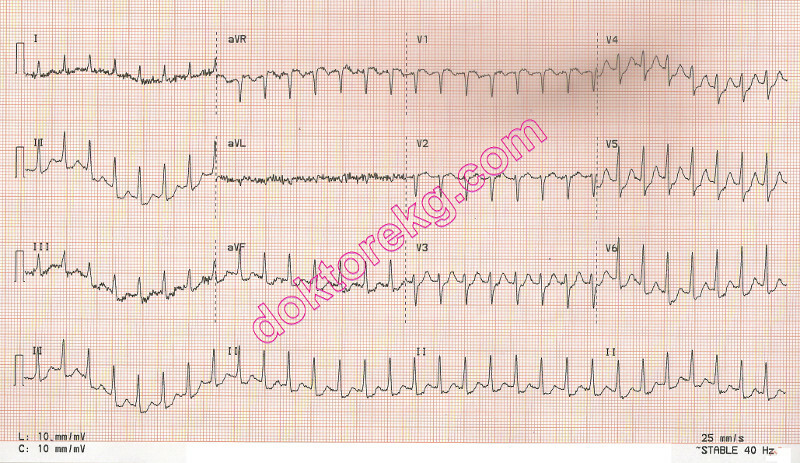 The above ECG belongs to the same patient and shows disappearance of Adenosine effect. It was recorded at 10:10:49 (it is the continuation strip of ECG 6c).